There is nothing amusing about “the meltdown”. It is reflective of a complete loss of control of the person with an autism spectrum disorder. It is often loud, risky at times, frustrating, and exhausting. Here is a video that explains meltdowns from the perspective of someone living with autism. Feel free to share with others, as it is available through youtube. Ask an Autistic: What is a meltdown? One might say that the loss of control overtakes the child. They need their teacher or parent to recognize this and help them to regain control, as they are unable to do so on their own. A child with autism in the middle of the meltdown desperately needs help to regain composure. Moreover, it becomes critical to learn to recognize when the meltdown is imminent. In this way, you can both work to prevent a meltdown. The individual with an autism spectrum disorder needs to learn how to recognize the feelings of escalation and then actualize strategies to de-escalate before the crisis ensues. That is why a “feelings chart” or “emotion rating scale” can be such an important strategy. Notice the left column of this particular feelings chart. 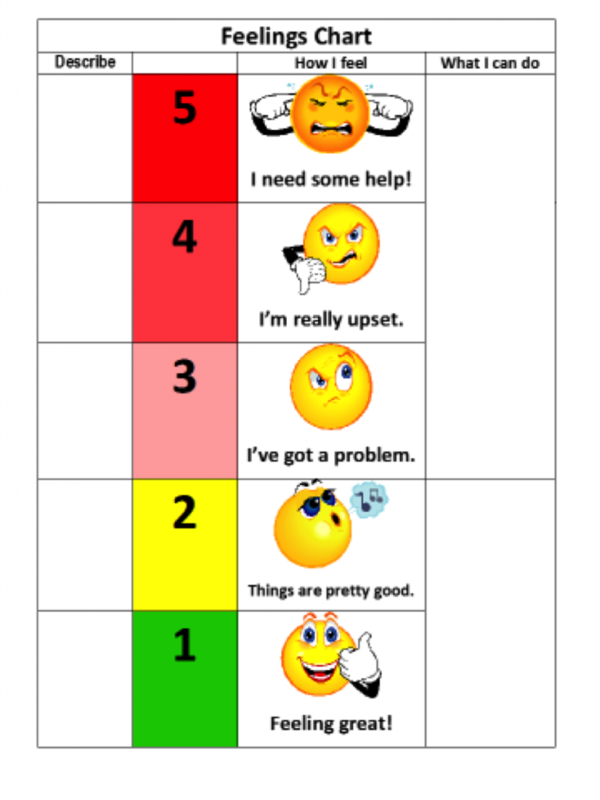 It should be reviewed when calm to help identify the internal and external indicators that emotions are changing. The right hand column is just as, if not more important, in that it helps to identify calming strategies for that particular individual. It is best to intervene early in the escalation process to increase the likelihood of a successful solution to the situation. We are not “giving in to” or “reinforcing” negative behavior when providing one of these calming strategies, but rather throwing a lifeline to someone that is unraveling neurologically for many possible reasons. I have found Ask An Autistic to be a great source of information, presented in a Pro-Autistic manner.